The Ford's acquired Liberty, a Golden Retriever, as a puppy in the fall of 1974. She grew up in the White House and even gave birth to her first litter of puppies there. A1813-5. 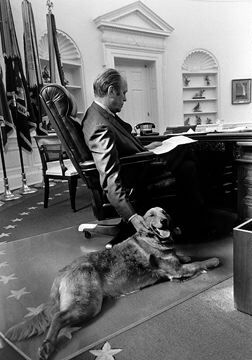 President Ford and Liberty in the Oval Office. November 7, 1974. Shan, a miniature sealpoint Siamese cat, belonged to Susan Ford. Shan lived with the Fords in their Arlington, Virginia home and moved to the White House with them. Shan slept in Susan's bed at night and spent her days with Mrs. Ford while Susan was at school. A1206-12A. 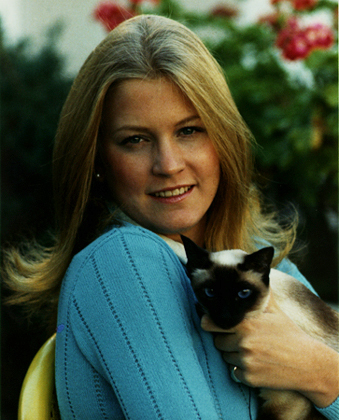 Susan Ford with Shan, the Ford family's Siamese Cat. October 4, 1974.